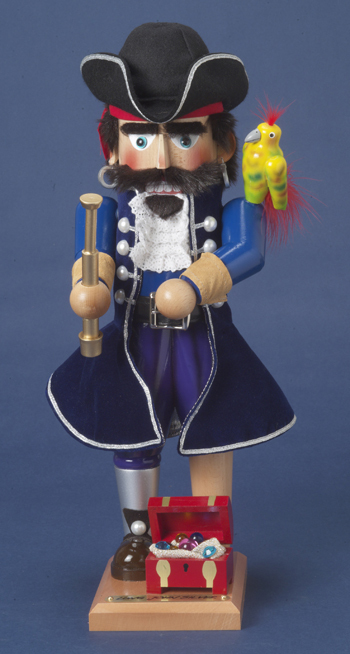 This 16" Steinbach Pirate Captain Nutcracker is sure to be a welcome addition to any holiday décor or nutcracker collection! Sure to appeal to seafarers and landlubbers alike, this pirate captain is wearing an intricately fashioned blue coat and pants, a ruffly white shirt, and a large, dramatic gray captain's hat. He has long, cascading, dark curls, and is equipped with two swords and one pistol. Like all of Steinbach's creations, he is hand-crafted in Germany with the finest care and attention to detail. 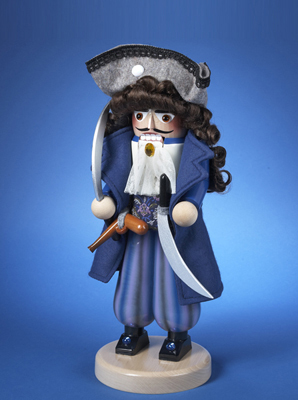 new nutcracker, the Steinbach Pirate Nutcracker Series. The first nutcracker to be produced was the Long John Silver (ES1921) nutcracker. Standing with a wooden peg leg at 17 inches tall, this nutcracker is surly a treasure. This nutcracker is a limited edition nutcracker at 7,500 pieces available. Long John Silver holds a telescope in his hand while his trusty parrot sits on his shoulder. This pirate nutcracker is truly captivating.